Over the past few months, a variety of urgent medical care issues arose that kept us traveling all over Kenya to get help! We continued to cover the costs of treatment and medications for a number people right in Oyugis’ s fine hospitals, but several instances required us to travel to Kisii, Kisumu and Nairobi. One young teen, Moses, couldn’t be diagnosed locally and sent us on to Kisumu where he was required to have day surgery to treat his issues. Another case that require several surgeries sent us to Nairobi to remove a facial disfigurement…one surgery down, another one yet to go. His dramatic picture and the change after just one surgery is included with this report. Several times we were contacted by local hospitals about children seen and released without necessary medications so we made sure they got them. Sonko came across a mom with her young children who needed to be seen. The little guy had a tumor growing on his leg and his little sister was suspected to have malaria…she did. Another child needed emergency surgery but had no money. 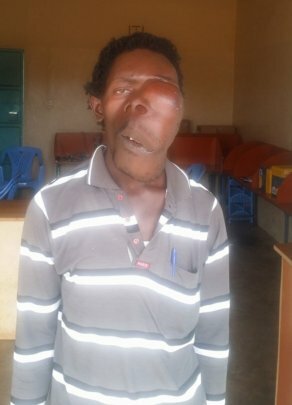 The hospital administrator made the decision to proceed with the life-saving surgery and then asked Olalo of Hope-Kenya to pay for it…. when and as we can. It is very humbling to be a trusted resource in the community and to be called on for the urgent needs that cannot be financially met by those needing to be treated. This is all possible because of YOU, our great supporters! Thank you for stepping up and helping us to save lives and make a difference in the lives of those who would otherwise go without urgent medical care. Your support for this is very much appreciated by all of us at Olalo of Hope-Kenya, and by those who lives are impacted through treatment received because of this medical project. Newer PostUp, Running and Saving Money Already! Older PostEducation Opportunities are Expanding!